You would think that my first example of Charlaine Harris' writing on this blog would be one of the Southern Vampire Mysteries, right? Nope. Instead it's the first book of her lesser-known series, the Harper Connolly Mysteries, mainly because I didn't feel like reading about vampires just yet. So is there a reason that this series hasn't had the same explosion of popularity that True Blood has? 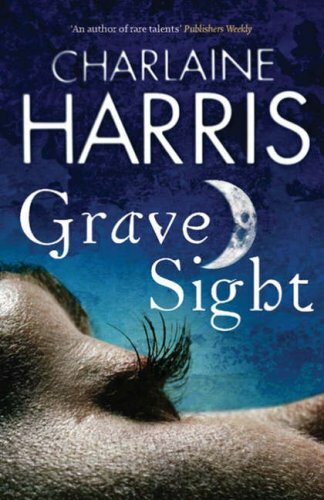 Grave Sight follows Harper Connolly and her step-brother Tolliver Lang as they travel to a small town in the Ozark mountains to try and track down the body of a missing teenager. Despite their intention to help, they are not given a warm welcome, as Harper's ability to mentally sense the location of the dead and see their last moments, gained after she survived a lightning strike to the head, leaves many feeling uncomfortable. At first, things appear to go according to plan: they find the body, cash the cheque and leave town. It is when they are called back to the town after another death that events start spiralling out of their control. I really liked Grave Sight. As a mystery, it's well-crafted and suspenseful. Admittedly, I had kind of guessed the murderer by the sixth chapter or so, but my reasoning behind it was slightly off, so I guess it balances out in the end. Much of the suspense comes from the character of Harper and her relationship with the world around her. She's incredibly blunt and abrasive to other people, because she knows that her abilities attract the disgust of the majority of people that she encounters; why make the effort to try and pretty things up if people are automatically going to think the worst of you? This makes her attempts at detective work significantly more difficult, as most people just don't want to talk to her, let alone sit through an interrogation from her. The fact that she's essentially an emotional wreck and physically weakened from the lightning strike only makes her more interesting to follow, as it creates additional obstacles between her and what she wants to achieve. The one thing that confuses me is the way that Gollancz has marketed the book. The back cover proclaims that Grave Sight is part of their Gollancz Romancz range. Admittedly, there is a sort of love interest, but it's not written in a particularly sentimental or serious way: there's never any implication that the encounters with this love interest will lead to anything that could be considered permanent. The only thing it really adds is some tension between the step-siblings, as Tolliver is unhappy leaving Harper with someone whose motives he isn't sure of.